Since 1878, Saint George Hospital has been supporting lives. A non-profit community hospital, Saint George has become synonynous with generosity and hope. Founded by people who cared, their quest has been carried on through generations. Today, the hospital has grown up into a total healthcare institution, providing overall in-patient services to the community. At the forefront of Medicine, Saint George Hospital is constantly in pursuit of excellence. The generosity of countless of supporters brought latest hight-tech equipment and made advanced interventions possible with some registered unprecedent breakthroughs in surgery. The recent conflict in Lebanon did little to diminish the aim of the hospital. Faith and devotion of many who served unselfishly during the hardest of times, helped to rebuild the social fabric of the country and further exemplify the value of the hospital as a cornerstone for the community. Many things have changed over the years, but Saint George Hospital is still committed to the challenge of helping to re-build the community in terms of healthcare, education, research, faith and heritage...committed to be supporter of life, in the name of compassion. Saint George Hospital University Medical Center is a nonprofit academic medical center, owned by the Orthodox Archdiocese of Beirut and is academically affiliated to the University of Balamand. It is committed to treat all patients with dignity, respect and compassion regardless of their religion, nationality, socioeconomic status and race. It provides quality healthcare services to the sick and indigent at the lowest possible cost. - Seeking to continuously meet the hospital main goals in alignment with its quality policy. - Seeking to consistently deliver high quality services to patients. - Seeking to be a leader and referral center for healthcare services both nationally and regionally. - Acting as a role model for Quality System application to influence the national healthcare system accrordingly. - Seeking to participate in developing a healthcare policy in the country. - Compassion: We provide care with dignity, and empathy to our patients. - Respect: We treat every patient with integrity, honesty, and fairness regardless of his/her religion, nationality, socioeconomic status and race. - Commitment: We are commited to deliver high quality services to our patients. - Teamwork: We work collaboratively with open communication and coordination among all departments to achieve the hospital vision and goals. - Safety: We maintain a secured and healthy environment for all staff, patients, and visitors within the hospital premises according to national laws and international standards. - Privacy: we protect the patients privacy and maintain the confidentiality of all their health information. Saint George Hospital University Medical Center is committed to achieve excellence in medical services through the implementation of healthcare quality standards. This commitment is translated through the implementation of national and/or international requirements of quality standards in healthcare accreditation. This coupled with our long years of experience, momentum and tradition, shall formulate our “quality concepts” in patient care. Being a tertiary referral University Medical Center, the hospital always tries to ensure that all its staff including physicians, share the common objectives set by the Board, and works hard to meet the patients' expectations and looks forward to increasing their satisfaction. The hospital development process is designed to have a continuous input from all the hospital units and departments, using the appropriate quality management tools and methods to identify areas for improvement in order to meet the hospital mission and the strategic goals. Since its inception, Saint George Hospital University Medical Center (SGHUMC) has always believed that medicine is an act of care and compassion whereby patients, physicians and staff are at its core. Based on the belief in meeting patient needs and transcending it to a memorable experience, the hospital has embarked in the 1990s on a continuous quality management journey starting with the ISO 9000 family and eventually adopted the National Hospital Accreditation scheme to be excellently awarded accreditation since 2001. Mr. Panayot Fakhoury, a member of the Orthodox community, donated two rooms in his Gemayze home to be used as a clinic and in-patient facility. In 1880, 416 patients were treated, 18 of whom were hospitalized. By 1881, the number of patients reached 2000. To cope with the patient load, a hospital of six rooms was constructed in 1883. Six doctors worked tirelessly, three of whom were American citizens headed by Dr. Cornelius Van Dyck, who later on founded the American University of Beirut School of Medicine. As the hospital reputation grew, so did patient demand. This led to the construction of a 90 bed hospital which saw completion in 1913. 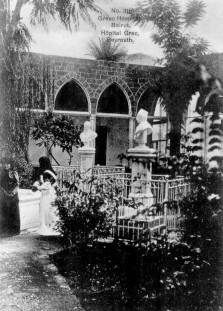 The philanthropic society and the "Waqf" of the Saint George Church secured funds for the new site. The hospital was confiscated by the French authorities between 1919 and 1923. During this time it was used as a teaching center affiliated to the Saint Joseph (French) School of Medicine. To meet the high demands of caring for a much bigger flow of patients, the hospital once again had no choice but to expand. 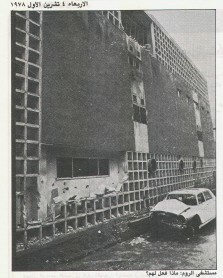 A new 275 bed facility was completed in 1966. This year saw the start of an era of hardship in Lebanon. Internal conflicts and terror demolished most of the country’s infrastructure. Deaths and casualties were many. People bonded together and helped each other to get through the suffering. Saint George Hospital did not close its doors at all. Quite the opposite, there were times when surgery was performed in hallways due to lack of space. Clean drinking water and food for the elderly were distributed to homes. In the midst of the unrest and with a delay of five years due to internal conflicts, the hospital marked its centennial anniversary. His Eminence, Metropolitan Elias Audi truly described the spirit of the hospital and its mission with the words "it is not by accident that we are in this part of the world, but a living witness to His Glory. We shall stay, serve and preserve unto the end by the Grace of God". As the conflict continued its rage and ravage, the struggle to provide quality care and service continued. During these years three major services became available at the hospital: CT Scan, Open Heart Surgery and Quality Assurance. A year full of events to celebrate 125 years of service to the community. A year to be remembered by many who participated in some of the 24 activities ranging from conferences to cultural events, concerts, recitals, a photo contest, a walkathon, a health fair and planting of trees. A year that culminated on April 23, 2004 with a Gala Evening dinner held at the Phoenicia Hotel.